CIA aerial view of Osama bin Laden's compound from east. Abbottabad 2011: What Really Happened? Is everything we know about the Osama bin Laden raid wrong? Seymour Hersh, the investigative journalist who broke major stories like the My Lai massacre in 1969 and the atrocities that took place at Abu Ghraib just over a decade ago, has a 10,000 word take on “The Killing of Osama bin Laden” in the London Review of Books. Released over the weekend, the piece appears to have sparked major controversy, with critics citing it as a thinly sourced step-over into conspiracy theorizing. 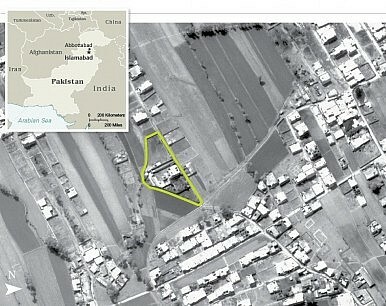 In short, Hersh alleges that instead of the conventional history of the raid on bin Laden’s compound in Abbottabad, Pakistan—a stone’s throw from Pakistan’s military academy—being a covert U.S. operation without the knowledge or complicity of the Pakistani military-intelligence elite, the “truth” was that the U.S. and Pakistani intelligence establishment struck a deal: bin Laden’s life in exchange for greater leeway for Pakistan in Afghanistan, and more military aid. In essence, per Hersh, the current state of U.S.-Pakistan relations (which are rather poor, if you’ve been keeping track) is all a ruse to keep up appearances in the wake of that deal. Approach this story with a healthy deal of skepticism, and do read the various dissenting takes and ripostes that are slowly cropping up (Max Fisher’s take at Vox is probably the most accessible, but New York Magazine, and Peter Bergen at CNN are worth a read too.) The White House, for the record, has dismissed the story as full of “inaccuracies and outright falsehoods.” Whatever happened in Abbottabad in 2011 marked a turning point in the United States’ global war on terror and will likely remain out of the public domain for decades to come, but Hersh’s take, for all its purported details and revelations, doesn’t add up. If you missed it and have a few hours to kick back and enjoy some light reading, take a look at the U.S. Department of Defense’s 2015 report on China’s military and security developments (PDF warning). If you need the executive summary, the report conveniently contains one–otherwise, you can read my reflections here. My colleague Franz, meanwhile, has a handy collection of China’s reactions to the report here. Another reaction worth reading comes courtesy of Andrew Erickson at the U.S. Naval War College. Keep an eye on this going forward (The Diplomat will be): China is looking at setting up a naval base in Djibouti, ostensibly to aid its counter-piracy operations off the Horn of Africa and in the Gulf of Aden. Over the weekend, The Diplomat reported on what is believed to be North Korea’s first successful ejection test of a submarine-launched ballistic missile (SLBM). NK News has a detailed take of the security and deterrence implications of North Korea’s bid for a robust SLBM capability. CSIS’ Victor Cha has a short but handy FAQ on the whole incident as well. How Does Japan View the US View of Preemption on the Korean Peninsula? The Trump administration has decided to rhetorically investigate a policy that neither Seoul nor Tokyo can genuinely support.